KGB  is the Russian-language abbreviation for State Security Committee. It was the main internal security agency for the Soviet Union from 1954 until its break-up in 1991. It was formed in 1954 as a successor of earlier agencies, the Cheka, NKGB, and MGB. During the Cold War, the KGB suppressed "ideological subversion". This meant suppressing unorthodox political and religious ideas, and the people who held those ideas. It was Soviet policy for the KGB (and the secret services of the satellite states) to monitor public and private opinion, internal subversion and possible counter-revolutionary plots in the Soviet Bloc. The KGB was instrumental in crushing the Hungarian Revolution of 1956, and the Prague Spring of "Socialism with a Human Face", in 1968 Czechoslovakia. A record of some of its doings is contained in the Mitrokin Archive. From 13 March 1954 to 6 November 1991, KGB was the main name for the main Soviet security agency, intelligence agency or spy agency, and the secret police agency. In March 1953, Lavrenty Beria merged the MVD and the MGB into one agency—the MVD. 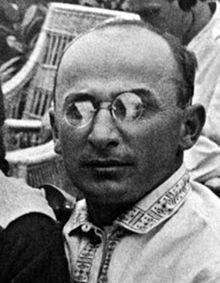 In December of that year, Beria and six associates were executed and the MVD split. The re-formed MVD retained its police and law enforcement powers, while the second, new agency, the KGB, did the internal and external security functions, and reported to the Council of Ministers. On 5 July 1978 the KGB was renamed as the "KGB of the Soviet Union", with its chairman holding a ministerial council seat. The KGB ended when its chief, Colonel-General Vladimir Kryuchkov, used the KGB's resources to help the August 1991 coup attempt to overthrow Soviet President Mikhail Gorbachev. On 23 August 1991 Colonel-General Kryuchkov was arrested, and General Vadim Bakatin was appointed KGB Chairman—and mandated to dissolve the KGB of the Soviet Union. 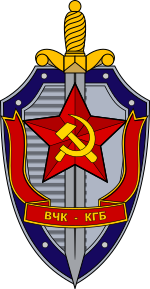 On 6 November 1991, the KGB officially ceased to exist, although Russia's new national security organisation, the Russian Federalnaya sluzhba bezopasnosti (FSB), works in the same things that the Soviet KGB did. Belarus is the only post-Soviet Union era country where the national security organization is still called "KGB". Belarus is where Felix Dzerzhinsky started a group called the Cheka, which was an organization in the Soviet Union before the MVD or the KGB was started. ↑ Christopher Andrew. "The Sword and the Shield: The Mitrokhin Archive and the secret history of the KGB". The New York Times. This page was last changed on 11 June 2018, at 23:56.